As Lindsey Norris looks out a window while working at the Briar Creek Public Library, she witnesses a hit-and-run accident. A car hits tennis coach Theresa Huston and flees the scene. When a second attempt is made on Theresa’s life, it’s obvious the incident with the car was not accident and the drive had tried to run down Theresa on purpose. Lindsey swears she will play it safe and focus on her job and her love life and won’t get involved in the case, but soon she is using her research skills to try to uncover the person who is trying to kill Theresa. Although this book is part of an ongoing series, new readers will enjoy it as much as those who follow the series. I’ve read most of the books in the series and find it to be inconsistent. Some of the installments have been exceptional and some a little too lightweight. Hitting the Books is somewhere in the middle. The plot is interesting and the book moves quickly. Lindsey acts more maturely in this outing and hers and the other characters’ dialogue is realistic. I’m glad Lindsey and British actor Robbie Vine are now just friends and investigative partners. He is better boyfriend for Emma, the chief of police, than as a potential love interest for Lindsey. Lindsey has now been living with her boyfriend Sully for six months, but still questions her choice to move in together. She worries about this throughout the book and makes a surprising decision. Even though Lindsey keeps saying she isn’t going to get involved in the case, she makes a good investigator and with Robbie’s help, learns things that Emma isn’t able to. There are a few different viable suspects in the attempts on Theresa’s life and other crimes, so I remained interested what would happen next in the investigation throughout the book. I like that Lindsey is able to use library circulation records to help Emma solve the case. 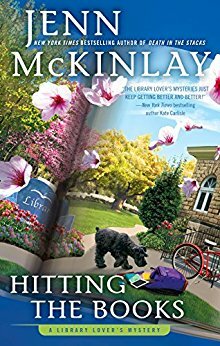 The author doesn’t simply tells us Lindsey is a library director, there are many scenes that take place in the library with Lindsey on the job or on the case. There are scenes with Lindsey helping library patrons and also getting together with other library employees and friends for their weekly “Crafternoon” sessions for discussing books, doing a craft, and snacking. As expected, the book discussions usually lead to talking about the case Lindsey is investigating. I enjoy the rapport and inside jokes between the characters that make these scenes are the highlight of the book for me. There are even book discussion questions, recipes, and instructions for making a craft item at the end of the book for readers who want to have a “Crafternoon” of their own. Although this isn’t my favorite of the books in this series, it’s still an enjoyable read for fans of the author or of anyone who enjoys a good cozy, especially one set in a library.